"I think you're beautiful," he says softly. "Beauty fades," I choke out. "Not when it comes from the inside." "What people see? That's only gloss. But, Anna, you light me up. Drew. Not the player. You didn't know how to live under my light? I don't have light anymore unless you're there." Making Anna happy makes me happy. "To be clear," I tell her, "being with you is the highlight of my day." Thick lashes cast shadows at the tops of his cheeks. "Your voice isn't noise. It's a song I want to hear over and over." I've heard people talking about this book for a while now. 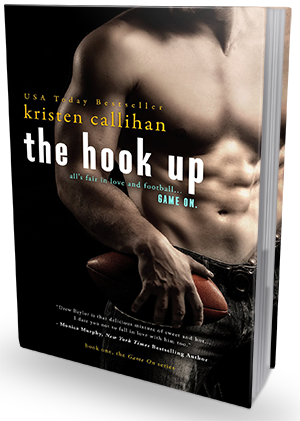 The Hook Up and The Deal (by Elle Kennedy, which I have and will probably review in June!) have been recommended to me many times. Just the other day I was in serious need of a swoony read, so I asked Twitter for suggestions. When someone mentioned The Hook Up, I thought it would be perfect. And I'd already had it on my kindle---you know, since people had been talking about it for a while. Of course I had 1-clicked it at some point. So I started it. And I read it. And I must say, I'm kind of disappointed. I liked the book. It was good---VERY good at some points. But overall, it didn't really wow me. In regards to being swoon-worthy, in that people were mostly right. There was more swoon in some parts than others, but throughout the book as a whole there was definitely heaps of it all over the place. I think one of my biggest issues with this book was...well, Anna. I'm not going to say I disliked her, but I wasn't really a fan of her, either. Not my least favorite heroine and not my most favorite. She starts out so mean and closed off in the beginning of this book, so that the story was really carried by Drew. Anna gets better as the story progresses, but her original stand-off-ishness resonated for a while. I didn't end up really, truly loving and believing in the couple until about halfway through. I had fond feelings for them before that. I wanted them to work out before that, too. But I wasn't REALLY INTO IT until around the halfway point. And since there wasn't much of anything else going on, that meant I didn't get super invested in the book until that point. Also, it bothered me that one of their huge relationship flaws was rooted in communication. Drew and Anna are big about being blunt with each other. That honesty was great---until it got to the most important, fundamental things that were holding their relationship together. Anna wouldn't open up, and Drew was holding back. I just wanted them to TALK TO EACH OTHER and get together, but that took so long to happen. This is the first book I've read by Kristen Callihan, though I've heard the most complimentary things about all of her novels. Still, I wasn't sure what her storytelling was like. Turns out, I'm actually a fan of her writing. The Hook Up is in dual POV, and Callihan definitely gave both characters their own distinct voices. I admit to enjoying Drew's more than Anna's, but that doesn't take away from the fact that they were both written very well. Even if I hadn't enjoyed The Hook Up, I'd be open to reading another book by Callihan anyway. But I DID enjoy The Hook Up. There was lots to swoon over. So much sweetness. While there wasn't much driving the story forward, it was not anything near a chore to read Drew and Anna together. And it only got better the farther into the story I got, seeing as they grew closer and their relationship became more of a true RELATIONSHIP. They just got better and better, and I ended up loving them as a couple. While I wasn't much of an Anna fan in general, I was a Drew fan from the very start. His first meeting with Anna wasn't the best, but reading it from his POV made it make more sense---and endeared me to him in the process. He and Anna had such different views on relationships and how they could work. I loved how Drew knew what he wanted and went for it. Later in the story, he has some rough patches, and those really felt like a slap in the face, but when everything was said and done, Drew was a great guy. Definite book boyfriend material. The banter between Drew and Anna was so witty. It made the entire book so much more enjoyable, and helped to make their relationship more likable before they themselves grew closer and made me start really rooting for them. This couple was so evenly matched in their humor and their lighthearted arguments, it was outright cute to read. And funny. Definitely funny. Overall, while The Hook Up wasn't as great as I'd expected it to be, it was still a novel I ended up liking. A nice heaping of sweetness mixed with the perfect dose of banter makes this story one romance readers should check out. This book was good, and I think the rest of the series has serious potential to get even better. I'm so looking forward to the second book myself, The Friend Zone, which focuses on Drew's best friend Gray. No doubt in my mind, I'll be picking it up sometime soon!